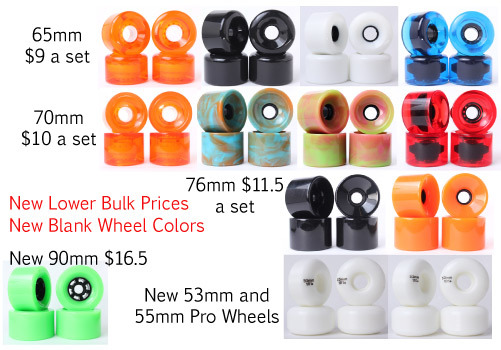 New lower prices on all longboard wheels blank and printed 65mm $9 a set 70mm $10 a set and 76mm $11.5 for bulk prices only and new colors in the blank wheels. We also have new sizes in our pro wheels 53mm and 55mm. We have added our largerest wheel to the fam at 90mm. 48" Blank Dancer Dark Walnut Longboard Deck: Top and botton dark walnut veneers with Canadian maple middle. Drop Down Blank Longboard Deck: Top and bottom dark walnut veneers with Candian maple middle. 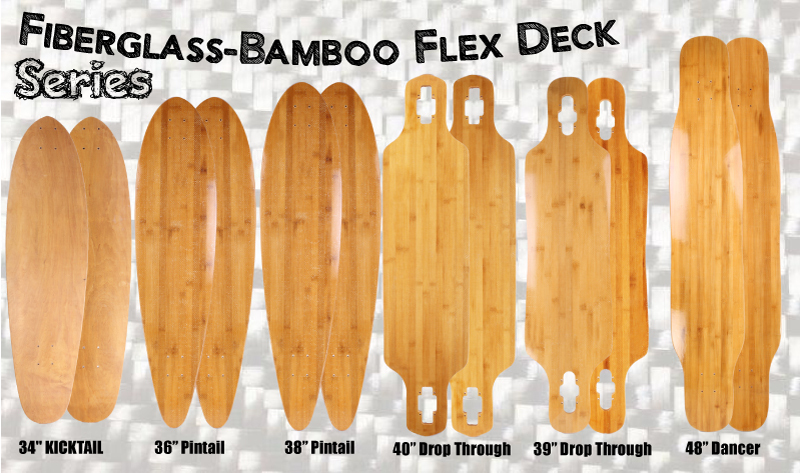 36" Missle shape downhill speed blank longboard deck. Made with Candian maple wood the deck is constructed with double wide wheel wells and adjustable wheel base mounting holes. 37" Arrow shape dowhill free-ride blank longboard deck: Made with Candian maple wood the deck is constructed with double wide wheel wells and adjustable wheel base mounting holes. 32" Fish Surf Shape mini cruiser skateboard: Made with Canadian maple. 7.75" Professional Blank Skateboard Deck. Made with hard Canadian maple wood with top, bottom and middle stained plys. 8.3" Professional Blank Skateboard Deck. Made with hard Canadian maple wood with top, bottom and middle stained plys. On orders over $300 always be sure to download the newest pricelist or email us at skateshred@yahoo.com subject line (pricelist) and we'll send it right over. Any questions about our products/bulk discounts please email or call.